I had a tough time coming up with a public sphere of influence that would compare to the examples already posted (a mall, sports stadiums, DVDs, suburbia). One idea that kept returning to my thoughts was Times Square. I believe the myriad meanings associated with the area can provide a rich discourse on the subject of human-built environments. Like many young adults from suburbia, I dreamed of “getting out of Dodge” and making it big in New York City after school. Two months after graduation in 2007, I moved to the Upper-Upper East Side of Manhattan and got a job working as a web designer near the Flatiron building. Before I lived in New York, I saw Times Square as a glamorous beacon of the metropolis, pulsing with the electric heartbeat of the city. My opinion changed for the worse after living in Manhattan for a few months. I began to see the dazzling ads displayed on billboards as gaudy representations of a city fueled by consumerism to the detriment of compassionate human relationships. It is well known that no self-respecting native New Yorker would choose to spend time in Times Square. The irony of this can be seen in the massive Target advertisements perched on multiple building in the area for more than 7 years before a branch opened in Manhattan. The media has had a defining hand in shaping the area and its experience. It’s named after the New York Times building (the founder of which asked the city to rename the vicinity after moving in). 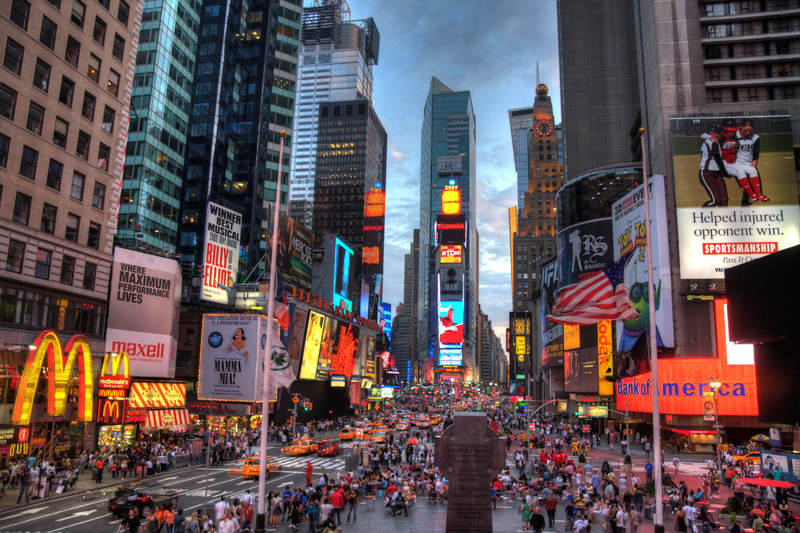 Theater and other (seedier) entertainments flourish(ed) in Times Square; it’s home to Broadway, after all. Even the neon lights and advertisements that sprout like weeks from surrounding buildings are popular tourist photo backdrops. The crushing crowds stream in from all sides, eager to take pictures and experience the area. But what does the area have to actually experience? Avant-garde theater no longer exists, after being pushed out by revivals of popular performances guaranteed to make money instead of sparking controversy. Nor do any commercial establishments exist that cannot be found in a suburban mall—FAO Schwartz is now a Toys R Us, and the only Red Lobster and Applebees in the city are located on 42nd Street. bell hooks stressed the importance of space as defining the activities and people that inhabit it in Black Vernacular: Architecture as Cultural Practice. Perhaps Times Square is meant to be a shrine to consumerism with oversized ads serving as icons of capitalism. To me, Times Square represents a simulacrum of city life. It is an area that defines New York, yet it is meant to shape visitor perceptions to enjoy a cleaned-up, Disney-fied city where everything is for sale. It is a marketer’s dream, where tourists pay to take pictures next to advertisements. But who am I to look down upon this? 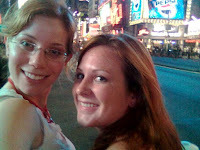 After all, I too have the requisite Times Square photo—this was taken with a friend my first week in the city. I’m on the left, wearing glasses. hooks, b. (1995). Black Vernacular: Architecture as cultural practice. In Art on my mind: Visual politics (145-151). New York: The New Press. Introduce self by locating and describing a public sphere of influence in the human-built environment (e.g., mall, Internet site, television show, listserv, news broadcast, advertisement, artwork, built-environment).